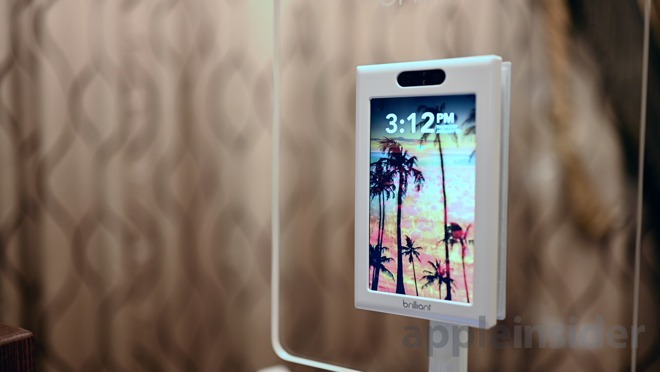 Brilliant is one of the latest to integrate HomeKit into its smart home gear with the the company's touchscreen wall controller gaining support for Apple's smart home platform this spring. AppleInsider went hands-on ahead of the release to try it out and see what HomeKit will be able to do. Available to fit one, two, three, or four switch receptacles, Brilliant's smart home controller is barely larger than a standard wall plate —regardless of the number of switches. No matter if this is replacing one or four wall switches, the screen stays the same size with either two, three, or four touch-sensitive channels to the right of the screen on everything but the single-switch version. As a basic overview of the product, it has a touchscreen to act as an interface for nearly all your smart home products. There are native integrations between some of the most popular ones on the market including Hue, August, Ring, Sonos, and more. If you have multiple Brilliant wall plates in your home, you can use the intercom feature to allows for a video call between the different rooms in your house. Aside from acting as a video call camera, the sensors towards the top also are able to identify your fingers. A swipe up or down in midair turns the lights on or off. Touching and dragging on the screen dims or brights them. With a two finger air-swipe, you can kill all the lights in the room, and turn them back on. This is also where HomeKit joins the party. Using HomeKit, you can ask Siri to turn the lights on/off as well as dim them. This is a bit shallow in the HomeKit integration, but it certainly is a start. Brilliant hopes to integrate additional HomeKit functionality going into the future. It is easy to see how the camera could show in the Home app or how HomeKit scenes could be shown on the display. Despite not all of the features being fully implemented in HomeKit, there is still a wide variety of tasks Brilliant can pull off and it looks like one of the more unique smart home products to hit the market. HomeKit support won't arrive until the spring, but if you want to get started early, you can grab a controller or two from Brilliant's website.